One of Mucha's most endearing and enduring sets. 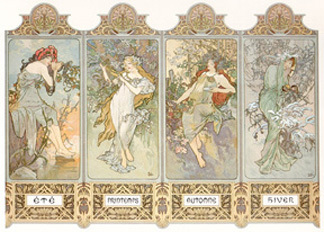 The idea of personifying the four seasons was nothing new, the printer Champenois had done it before with other artists, but Mucha breathed so much more life into it that this became one of the best-selling sets of decorative panels, and he was asked to repeat this theme at least twice more, in 1897 and in 1900, and he also did another panel with only three of the seasons. Spring is a blonde sylph who seems to be fashioning a makeshift lyre out of a bent green branch and her own hair, with some birds as interested spectators. Summer, a brunette, sits dreamily on the bank of a pond cooling her feet in the water and resting her head against a bush. Autumn is an auburn lady, making ready to partake of the ripe grapes. Winter, her brown hair barely visible as she huddled in a long green cloak, snuggles by a snow-covered tree trying to warn a shivering bird with her breath. In this variant (1896), all four panels were printed in smaller format and placed in an ornamental frame, with the names of the seasons on a decorate background underneath. Each panel is surmounted by a cameo-like ornamental motif. For unknown reason, Summer comes first then Spring, Fall and Winter.